Use Grocery List to Save Time, Eat Healthier! 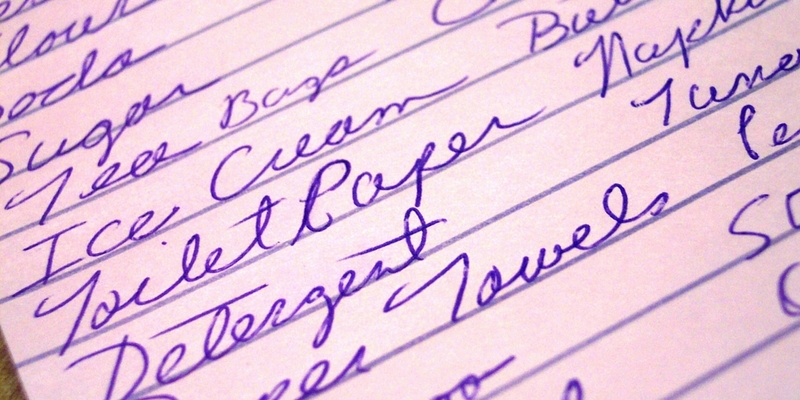 Perhaps you've heard that it's a good idea to shop with a grocery list. Yet even when you make a list, you still forget to buy foods you need. Do some types of lists work better than others? Many organizational experts recommend making some type of list with similar items placed together. Grouping foods by category on your grocery list helps you remember food items and avoid a return trip to the store. Also, by grouping foods together, you're less likely to double back in the store for a food missed when in a particular section. To save time, you might develop a form you can photocopy or print from your computer for weekly use. Keep your list in a central location where your family can add to it as needed. Some people keep it on their refrigerator with one of those strong magnetic clips. Other people store theirs in a cupboard drawer. Be sure there's a pencil nearby, or if possible, attach your pencil to a string! Here are some tips for developing a master list for ongoing use. Suggested category headings are given in the section following these tips. Leave enough space between headings to write in the number of items you're likely to include in that category. Modify as works best for you. Also, check the many organizational books on the market for additional ideas. Consider listing foods by categories based on food groups. This helps assure your meals include a mix of healthy foods. Some people like to arrange the categories in their list around the order in which foods are found in the store. Their master list may include such headings as "canned goods," "frozen foods," "fresh produce" and so on. The best way to develop this type of list is to go up and down the aisles of your store and record headings that describe your food purchases. Use the informational signs located in each aisle as a guideline. Or, check if your store provides a map showing where products are located and develop your master list from this. Be aware that stores do change where they place foods. Also, this type of listing works best if you shop mainly at one store. Add some type of catch-all grouping for condiments, staples and other food items that don't fit anywhere else. Include categories for non-food items that you purchase at the grocery store such as health and beauty aids and household supplies. Grouping these together has an added benefit of helping you see how much of your "grocery" bill is going for items other than food. In reality, it may be toilet paper or tooth paste rather than tomatoes or tuna that add the most to your "food" costs. If there are foods and other items that you must have every week, give yourself a reminder by making them a permanent part of your master list. For example, if you always like to have some carrots in the house, write carrots under your Vegetable category heading. Then, if you need carrots that week, circle that item. "Play" with your master list for at least a month to find what works best for you. Or ... rather than a paper and pencil list, you might check out the various apps that help you keep your list on your smart phone. Some of them can be synced across various devices and even shared with others. Added features for some include information on related coupons, recipes, healthy food recommendations and more. Before paying for an app, try some of the free ones first to see how you like this method of keeping a grocery list. Or, if you already use an app to keep lists, include groceries among the lists you set up. List brand names, can sizes, etc. as needed especially if others are shopping for you. Sometimes, you may wish to wait until you're at the store before deciding what specific foods to buy within a category. For example, you may wish to view the types of fresh fruits or check out meat specials before deciding on your purchase. To assure that you get enough foods for your meals, simply write how many items you need from that group. For example, if you need meat for 7 meals, write "7 meats." Remember that time spent developing a list is usually less than time spent returning to the store for a forgotten item. Having a list may also contribute to your overall meal quality. For example, do you really like to strain your coffee through a paper towel when you're out of filters!